MINAS TIRITH, Gondor, Middle Earth -- After months of tension between the forces of Mordor and the people of Gondor, Sauron has unleashed his forces on the people of Minas Tirith. An army of orcs 200 000 strong, and led by Sauron's new general the Witch King, have been sent from Minas Morgul, and have already taken Osgiliath for their own, butchering it's people with hoards of warriors. "We cannot lose the last defence of the river!" thundered Denethor, the steward of Gondor, when he was told. "We must take it back!" In his rage he sent out his best men to take back the city but they were killed by arrows before they could even get close. Many of the people of Minas Tirith would like to see Denethor in flames. They might get their wish. Gandalf the White, visiting the city, tried to call peace with Sauron, but it was no use. The orcs had already surrounded the city, and Sauron would not listen to words of peace. The orcs started firing their catapults soon after, bringing flame, rubble and confusion into the city, as fear set in. Gandalf has called for Rohan using an intricate set of piles of sticks sitting on mountains, but they have not answered, as they were away at the pony club show. The Gondorians will have to fight on there own, while Sauron has brought two groups of new reinforcements in. Giant elephants and pirates. "This is an outrage!" says Gandalf when interviewed by an UnNews reporter. "We try to make peace but they continue to fight! We have even had to postpone the FIFA Middle earth Cup because of this! I do so hope Frodo makes to Mt Doom!" 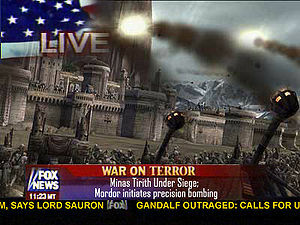 Sauron refused to comment, and killed the reporter as well. The current death toll is 256 humans and counting, while 50 orcs have been killed by Minas Tirth's trebuchets. The siege is suspected to last for days, unless something stupid like a giant army of green ghosts save them. But that's not going to happen. This page was last edited on 4 June 2012, at 09:33.